Surprisingly there are still a lot of people who are confused when it comes to social media marketing. Many of them want to simply know what it is and how to use it – something experts believe we’ll continue seeing more of as a growing number of people go online to talk to one another today. As this happens, businesses must keep up with it so their brand doesn’t become irrelevant. Lots of these strategies exist today, but the most popular one revolves around using Buffer to schedule your posts. However, you can’t just post “anything.” You must have a strategy in which you create posts that your audience finds engaging. This is how you’ll get them to follow your brand, engage in word of mouth advertising on your behalf, and like your posts. One way of doing this is by entering them in a giveaway or, at the very least, offering them some type of a discount. Besides just posting things online you must also respond to and engage with your customers. This is especially important today because communication happens at a lightening fast pace. Customers will grow annoyed or feel ignored just as quickly. For this reason, your social media marketing must ensure that your customer is heard so they don’t move on to your competitor. 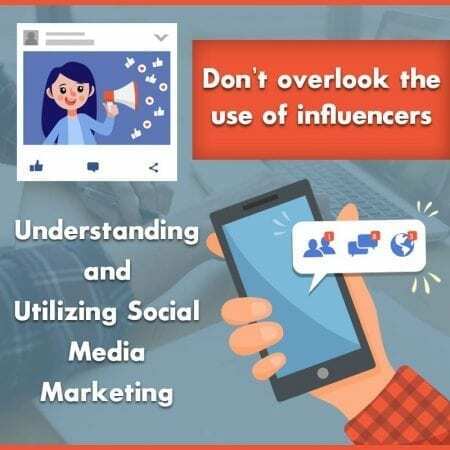 Additionally, don’t overlook the use of influencers (social media personalities with over 5k followers). These people influence many people and if you can get them to review your product or service it can really influence other people to also buy your product or service. It’s also important to have a social media marketing plan today. This is because traditional media marketing outlets (e.g. radio, TV, print) are both dead and gone. What will work best for you here though will depend on the size of your business, but the fact remains that you must have a plan here. As you’re putting your plan together it’s vital that you maintain your brand’s continuity. This is something that the best marketing companies accomplish without even realizing they’re doing it. For instance, we’d all wonder what’s happening if the Energizer bunny was suddenly some other color than pink. This continuity should be based on the demographic research you conducted when you first got started. Here you’ll learn what platform your customers use the most. These typically consist of Instagram, Facebook, SnapChat, and Twitter – each of which has its own audience with their own demographics. For instance, people with older demographics are better targeted through Facebook. Once you find the social media medium you want to use and start engaging people there, don’t stop. When you send out ads and people respond to them, make sure you have an employee there ready to engage with them. Today’s companies are selling more than products and services. They’re selling an image, an idea, a brand, which is why you see so many companies selling a message now (e.g. Gillette, Nike). This shows the importance of having a responsive brand that’s willing to answer criticism and customers what they’re thinking through any advertising they put forth. All these things are vital for you to remember when you’re trying to be successful with your social media. You can’t afford to overlook even one small item that was mentioned here. Since you probably already have more than you can remember in your mind, it’s a good idea to have a professional take care of this marketing for you. So, whether you need help creating and developing your social media marketing strategy or plan, the Affordable SEO Company is there for you. They’ve helped many businesses successfully conquer this part of their marketing agenda and yours should be next.